Chinese tourists take photos of Adam Kokesh while he uses a pretend gun to “detain” volunteers protesting the war with him. They cut a swath across downtown, taking sniper fire and casualties on the grounds of the Capitol and the Washington Monument, scouting the White House, performing arrests at the foot of the Capitol steps and a vehicle search on the Mall. 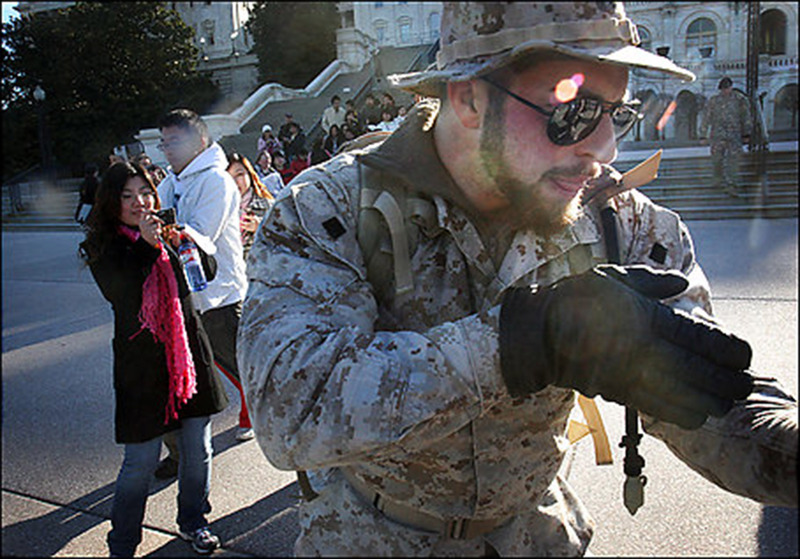 At the Capitol, the veterans were almost detained by civilian peace officers with weapons. The vets brought their action to a military recruiting station on L Street NW and concluded with a memorial ceremony in the cemetery. The 12 men and one woman included one veteran of Afghanistan, and they represented the Army, Marines and Navy. They were young, intense, disillusioned. Home from the war, on yesterday’s fourth anniversary of the Iraq invasion, they brought the war home to Washington… they captured the Capital. They called it Operation First Casualty — citing the adage that truth is the first casualty of war. The premise of their incursion was that, for all the yellow ribbons and “support the troops” sloganeering, life goes on at home pretty much oblivious to what it’s like for American soldiers and Iraqi civilians. The gonzo patrol was seen creeping down the arcade outside Union Station in formation at about 8:15 a.m. “Danger area ahead,” warned patrol leader Garett Reppenhagen, a former Army sniper with the 1st Infantry Division. They held their left arms out straight, like gun barrels, and gripped triggers with their right hands. He signaled for his men to sprint two by two through the arcade, past the Thunder Grill, to the Metro entrance. Outside the Metro station were about eight civilians with white T-shirts over their winter clothes, suspects and bystanders in a war zone patrolled by an edgy occupying army.